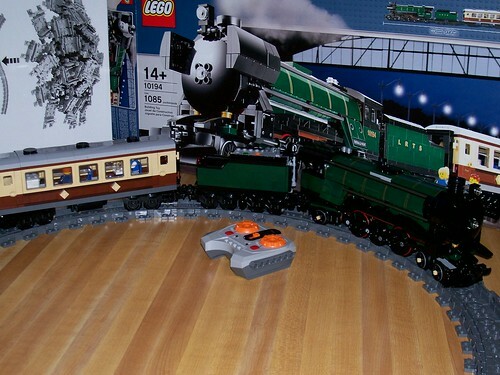 For Christmas this year, my mom got me a sweater, a necktie, a pocketknife, a toothpaste tube squeezer, and a LEGO set – LEGO Train Set #3677 Red Cargo Train. I went over to her house last night and we exchanged gifts, and she wanted to see what it looked like when it was built…. so I suggested we build it right then and there! To my surprise she wanted to do it, so I helped by sorting out the parts and going through the instruction book with her while she put the pieces on. Her 71 27 year old fingers had some trouble getting the pieces to go on, but it went pretty well. This was, I honestly think, the first time we ever did this! I think maybe one time as a kid I tried to work with her but I didn’t have the patience and took it away to do it myself. At least, that’s the sort of kid I was :-) but we went through the first two of seven bags (the locomotive, and the high-rail truck) and she built them all herself. But after that, her fingers were sore and it was like 11pm, so we stopped and I took the rest home. But it was really a nice little mother/son moment, even if it was 30 years late. A signal gantry I built over four tracks at Bay Area LEGO Train Club exhibit at the Train Collectors’ Association Cal-Stewart Spring Meet, Santa Clara, California, March 2-4, 2012. I built it Friday night after we finished the setup when I realized we would have a four track line without much decoration in that area. The signals over each track are based on the Union Pacific Signal Rules. Over each track there is a signal facing each direction, and each signal has three lights which could be red or green. I set up the signals with two each track marked “Clear” in one direction (top light green, two lights below red), and “Stop” in the other direction (all three lights red), in keeping with the direction of travel we used on the layout, but after I set all that up, someone put trains on running in the opposite direction (as shown in the photo below)! 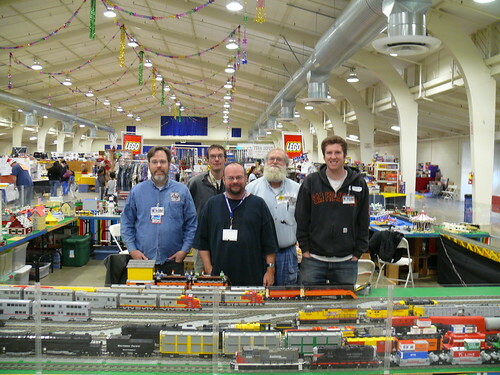 The Bay Area LEGO Train Club displayed a train layout at the Train Collectors’ Association Cal-Stewart Spring Meet, in Santa Clara, California, on March 2-4, 2012. This is one of our favorite events to display at, as they have a fairly low stress environment and it is in a very nice facility. We set up our exhibit on Friday afternoon, March 2, and finished setup Saturday morning. On Saturday, however, the show was only open to members of the TCA who were there for the Meet, so the crowd levels were low-stress. Sunday was busier, as it was open to the public from 10am-2pm. In past years, the attendance for the public day at this event has been fairly light, and we haven’t bothered putting up our “sneeze guards” (Plexiglass barriers that keep the little kids from reaching into the layout), but this year we quickly realized they had done a much better job promoting it, and we had to scramble to get the sneeze guards up before too many fingers found their way into places they shouldn’t (or worse yet, took things they shouldn’t … you know how grabby little kids can be around toys). Once we had them up, the crowd lightened up again, but we were still glad we did it. 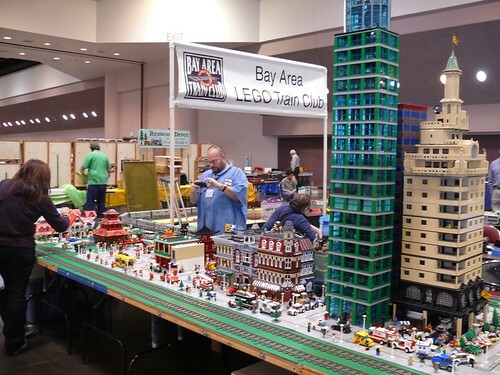 This event was held at the Santa Clara Convention Center, where we will be holding Bricks by the Bay in two weeks. While we were there, I had a chance to meet with our representative from the Convention Center and tour the facilities we will be using along with some of the convention volunteers who were also participating in the layout. We finalized the BBTB event schedule and locations where all the activities will be held. This year the layout was a rather unusual shape for us. Usually we make a big ring of tables, and Bruce brings a gate that carries two tracks across it, so we can have two loops of track circling the entire layout. But Bruce wasn’t able to attend so we tried a new design, making a large “C” shape instead, with the two loops of track doubling back at each end, making a total of four tracks around the layout. It worked quite well, but it presented us with a new esthetic challenge, as there was now a stretch with four parallel tracks and no structures. When I saw that Friday night, I decided we needed a signal gantry, so that night I whipped one up and I am quite happy how it came out. Take a look at the pictures from the show. Click the image below, or view all the photos as a slideshow. When I first saw the new bracket parts found in the LEGO Tipper Truck #4434, I realized I needed to use them to make a train car. I used parts from 2 of those sets to make this, along with a few parts I had laying about from other sets I’d recently taken apart (mostly the Maersk Train 10219). It was a very simple build – the main part is just two of the tipper parts from the Tipper Truck set with just a few tiles rearranged. The undercarriage is just made of plain grey plates, and the wheel trucks are quite simple. 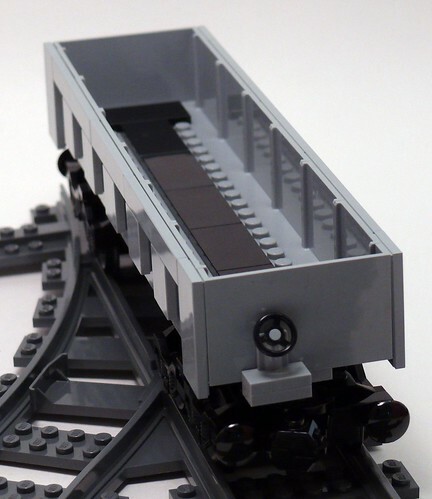 In 2008, I designed another Gondola car, using 1x2x2 panels with 1×1 bricks between for the sides. This was so much simpler, and arguably more realistic (thinner walls), though the older model has more details on the ends. Instructions for that older model are available, but the new part isn’t in LDraw yet so I can’t make them for this one for a while. This Railroad flatcar with bulkheads was inspired by the NMRA 2011 official HO gauge car for this July’s convention in Sacramento. 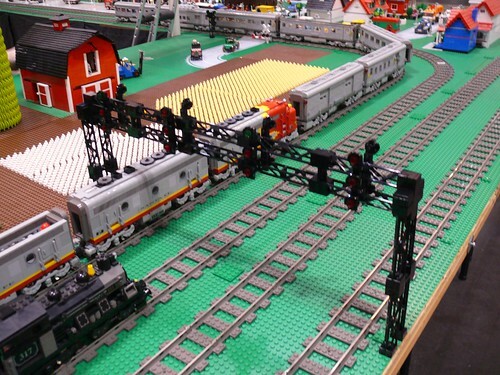 A bunch of us are planning to put together a large LEGO layout at the NMRA convention in Sacramento this July. If you want to join the effort, check out the planning wiki and sign up to participate. The Bay Area LEGO Train Club (BayLTC) just got done with a train show. 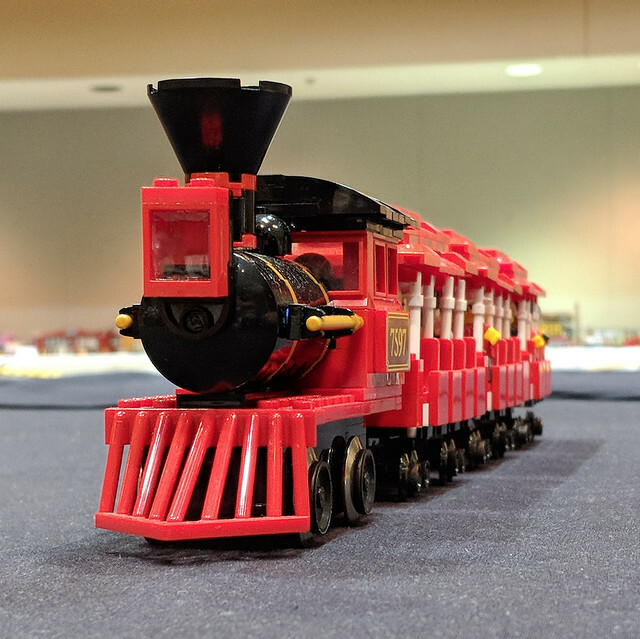 For the past few years we’ve been participating in train shows over Thanksgiving weekend in Pleasanton, at the Alameda County Fairgrounds, but this year the show was held in San Jose instead. We put together a large train layout as usual, but since several key members weren’t able to participate we had a little difficulty filling the space. Still, I think it was pretty successful over all. Click the picture above or view it as a slideshow. I came home this afternoon (Wednesday April 22) to find a nice box on my back porch… just finished building it at about 2:30 AM and here it is! I ordered K10194: Emerald Night Collection consisting of the engine, (10194, Emerald Night), power functions parts, and the new flex track. It works quite well with the IR remote control and the track is indeed flexible. But now, bedtime.